Happy New Year everyone! 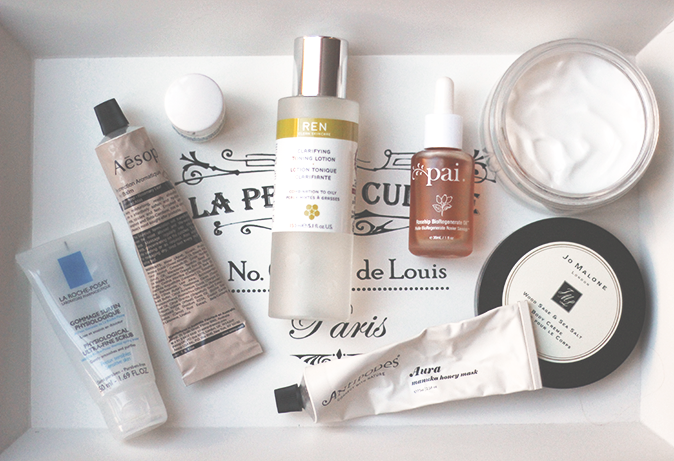 I'm a bit late to the party as always, but I had to share my favourite skincare bits from 2014 with you. These are the products that I've really depended on throughout the year, except for a certain hand cream that made a huge impression over the last few weeks. Without further ado..
You're probably sick of hearing me go on about my dry, spotty skin, but it really is the bane of my life a lot of the time. I've managed to get it under better control this year by following a much more simplistic regime than I've had in the past. By depending on the Pai Rosehip BioRegenerate Oil (£22) I've seen a massive improvement in my skin. It helps heal spots, fade the scars they leave behind and leaves my skin nourished and soft. It's really a wonder product and one that I recommend more than anything else. I've talked about this so much throughout 2014 and I expect I will for a long while yet. Another absolute staple for me is the Antipodes Aura Manuka Honey Mask (£22.50). Throughout the year I think I bought four tubes and I'm now about to use up the very last of this tube (sob). It helps cleanse my skin and packs a punch in the moisture department. It somehow draws out impurities without making you break out and my skin just loves it. A more recent discovery was the Aesop Resurrection Aromatique Hand Balm (£19.00). I wrote a full review of this dreamy tube of loveliness quite recently which you can read here. I'm borderline obsessed with this stuff, it smells divine and leaves my hands so soft. Face scrubs aren't exactly exciting are they, but they are definitely essential. Some can be far too harsh and scratchy though and this I can't bare. 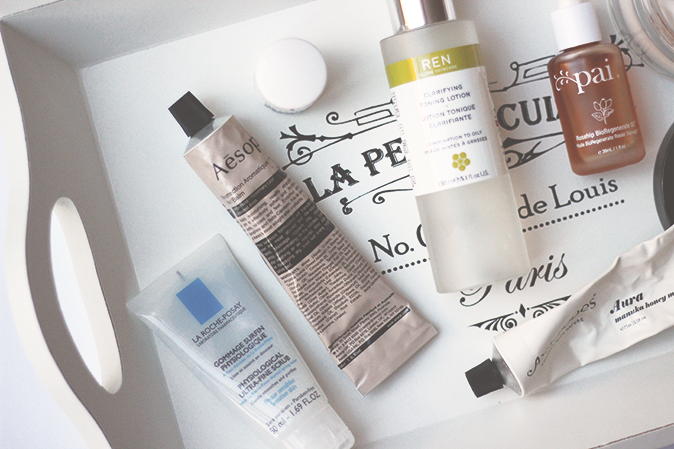 I've really loved using the La Roche Posay Physiological Ultra-Fine Scrub (£10). Its super gentle and yet effective at the same time. Plus it's often on a 3 for 2 offer in Boots so well worth stocking up on. I've tried quite a few products from the range now and they've all been really good. 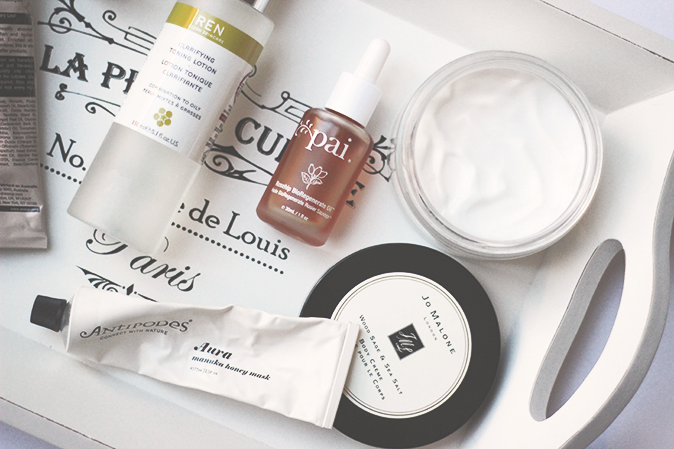 If you have sensitive skin this is a brand to check out. As well as using this scrub I really embraced exfoliating toners and my favourite affordable go-to is the Ren Clarimatte Clarifying Toner (£12.00). I use this a few times a week and really notice the difference. It brightens my skin and really helps clear away any pesky blemishes. I spoke in more detail about exfoliating toners in this post, but I'm a big advocate now as its such a great yet gentle way to slough away dead skin. Talking of blemishes, my favourite spot killer has got to be the Malin + Goetz 10% Sulfur Paste (£16.50) and I used up a couple of bottles of this odd little formula in 2014. It looks rather gross in the bottle but its so effective. As this is a white paste its definitely just for while you are sleeping, but it reduces spots super quick without drying out your skin too much. Also, you only need a tiny amount. I've found that using this 2-3 night in a row helps so much, my blemishes are massively reduced and less angry come morning. It wasn't available for a while which really panicked me, but thankfully Space NK have it in again! Lastly, 2014 was the year I ventured into the world of Jo Malone and I picked a cracker of a first scent which was Wood Sage & Sea Salt. I've gone through the cologne pretty quickly and have really loved the Jo Malone Wood Sage & Sea Salt Body Crème (£50). It's super thick and luxurious and sinks into the skin really quickly. I love coating myself in this after a long bath and getting into bed (with fresh sheets and pjs of course!). I'm fairly liberal with this stuff but it's still going strong. So there we have it, that's 2014 all done! If you haven't already seen it I've also done a similar post on my 2014 makeup favourites which you can read here. I'd love to know what you've been loving, so please let me know in the comments. The post 2014 Round Up: Skincare appeared first on Lelore.